Vini and Tilly are 7 years old - they are so very loved! Wherever I go, they follow. Vini has genetic ear problems and needs constant care for his ears. He is a lover and never gives problems about his ears. Tilly is my little Diva - very much the girl! My children are grown so these two have become my children. The hats they have on in this pic were just for the picture! The hat on Tilly was a crochet goof up, so I just put it on her. Vini's hat was given to me and was the inspiration for putting the hats on them. Thank you everyone for the nice comments. I love it when people make over them. Sorry to hear about your cocker's problems with his ears. Unfortunately, it's a common problem in cocker spaniels. I've been very lucky as my cocker doesn't suffer too much from problems in his ears. However, I still clean them every other day with a little bit of ear cleaner which I get from the pet store. I think that's the solution for many basic ear problems in cockers. Your cockers look beautiful and so smart in their hats! I too have cocker spaniel 'children' and I wouldn't have it any other way! I love my dogs and have to admit, I do treat them like little boys. I don't dress them up, I couldn't bear to do that. I don't put them in hats (but wouldn't object to it) but they do wear scarves around their necks. They look really sweet! 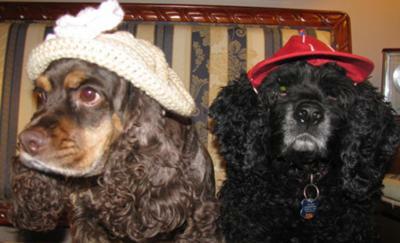 I think Tilly and Vini look adoreable in their hats - they're so cute! I hope you let them wear Santa's hats when the time comes - I bet they'd look really sweet in those! Vinin and Tilly - How Cute! I love their little hats! Don't Vini and Tilly look so very cute? Cockers very often suffer from ear problems - mine does too, although he's not very tolerant when I want to clean them. He shuffles around and moves his head to stop me from getting at them. It takes a military operation to get anywhere near them sometimes - he's even growled at me before now! However, he's not too bad. Your little cockers sound (and look) so sweet and gentle - I love them both! Awwwwwwwww...they are so very cute. They look so sweet together in the picture with their hats on.